Traversing picturesque countryside through the Counties of Waterloo, Perth and Wellington in Southern Ontario, one almost feels out of place driving a car. Fields of golden stooks await horse-drawn wagons to take them the barn for threshing. Doddy haus hunker next to century old farm houses with their telltale green trim. 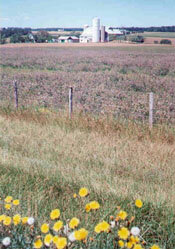 Homes are surrounded by large, well-kept gardens and orchards. Laundry billows in the wind on long lines. One drives carefully past black buggies with modern red triangular "slow vehicle" signs. 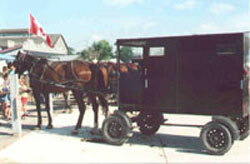 Farm wagons share gravel roads with enclosed Amish carriages. All are driven by "plain folk" dressed in serviceable dark clothing, cut in a simple old-world style. There is a tendency to ease up on the gas pedal as a peaceful serenity invades modern man’s fast paced lifestyle. Has time stood still? Is the world turning more slowly? Welcome to south-western Ontario’s Mennonite country. You are driving through some of the most fertile farmland in Ontario, which stewardship has been in the hands of these industrious people for several centuries. As an "English", I always experience a quietude when visiting Mennonite friends, Miriam and Isaac. 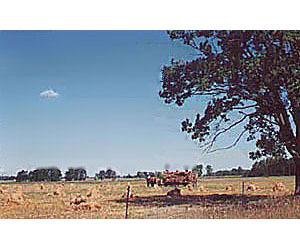 From their large farm kitchen, horses can be seen pulling a reaper in the neighbour’s field. Isaac’s herd of healthy Holsteins is grazing in a field next to fruit laden apple and pear trees in an orchard. Kittens lap milk from a pie tin on the porch while children play in a sandbox under a sugar maple on the lane. Miriam’s bountiful vegetable garden takes up a quarter acre beyond the washhouse. We have been schnibbling green and yellow beans all morning. Rachael, the matriarch of the extended family, rises from her rocking chair, shakes her apron out the door and exclaims, "It is nearly time for the sweets and sours yet." She is right. The noon meal fast approaches. Although more than eighty years old, Rachael is still very much a part of the harvest kitchen, just as her husband Jacob enjoys being a part of the outside work. Retreating to the doddy haus she returns with several pies. Rachael’s doddy haus gives privacy to the seniors, while at the same time gives access to the main house through a well-placed door. Traditionally, when there are many people to feed, the men eat first. Miriam scurries to set the oak table, extended with boards to seat seventeen people. She first spreads a large oil cloth then chooses cutlery and dishes from an ample supply in the "everyday" cupboard. The dish inventory can easily accommodate sixty people, which they often do, after church every second Sunday. Mary has prepared tender garden beans and carrots. Nancy is ready to add a touch of garlic, fresh thick cream and butter to the potatoes before mashing them. Miriam retrieves a cabbage salad from the spring house. The smell of fresh pork roasting in the oven has been tantalizing us for several hours. Jars of canned chow chow, spicy beet relish, sweet bread & butter pickle and the house speciality, small pickled corn cobs are emptied into serving dishes. A peek in the cool basement, divulges rows of canned vegetables, fruits, pickles and meat. When pressed for details, Miriam says that with an extended family of ten she must put down more than five hundred jars of product each year. Wooden bins hold potatoes. Carrots are stored in sand. Scoured crocks line a shelf, ready for sauerkraut making in October. 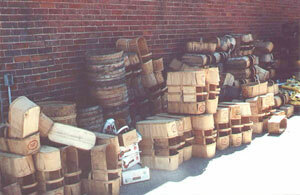 Barrels that will be lined with straw, await the apple harvest. Smoked hams and summer sausage hang in their own storage area. The hard work of harvesting makes for hearty appetites. The noon meal must sustain the men for a further six hours of labour. Miriam explains, "We serve a big meal. Our food might be plain for you but it is filling. Who is going to complain about pie at breakfast, yet?" Certainly not me! Traditionally the Mennonite table is set with seven sweets and seven sours, along with potatoes and at least other two vegetables to accompany the meat course. Desserts are placed in a row down the centre of the table before the meal begins. Pies, cakes, cookies, bowls of sliced fruit and rice pudding make pretty edible centre pieces. Heaping plates of fresh baked sliced bread and saucers of butter are set at each end of the groaning board. The menfolk come at the sound the big bell in its tower on the roof of the summer kitchen. After they have washed and are seated, the women scurry around, placing heaping bowls of buttered vegetables at strategic locations on the table. A platter of meat is set before the patriarch, who bows his head for a private grace. All at the table follow suit. One can hear a pin drop in the ensuing silence. The sign to eat is given when the patriarch takes a slice of bread. Then reaching for the meat, he says - "Eat, eat! Time does not stand still yet." Each takes a slice as the bread is passed. It will be used not so much to accompany the meal but to clean one’s plate before dessert. Each place has been set with nappie to hold pudding and fruit. Slices of cakes and pie are self-served onto the squeaky clean dinner plate. In Miriam’s home, tea and coffee are served only on special occasions, and then only one cup is poured per adult. A large glass of sparkling spring water is set at everyone’s place and full pitchers are put on the table, should anyone wish a refill. Talk, reserved until dessert, revolves around work. Arrangements are made for the menfolk to help an ailing neighbour get his crop in tomorrow. When the men vacate the kitchen for fifteen minutes rest under the sugar maples, the womenfolk clean, reset and restock the table. Their talk, in soft Pennsylvania Deutsche dialect, is all about food, canning, quilting, children and community. The chatter continues through their meal and during wash-up. There is a seasonal rhythm to Miriam’s kitchen bolstered by a simplicity in food preparation. 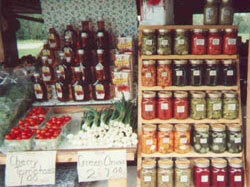 Despite Mennonite self-sufficiency, there are basic products which must be purchased, usually in bulk. Flour, sugar, salt and spices, oils, flavourings and leavening agents are on Miriam’s "town" list. Much of her purchasing is done at a country store run by fellow Mennonites. As an astute shopper, she confides that when in town she does shop at the big store owned by the "English." She loves to see what new product and fresh produce are available. An excellent cook, Miriam marvels at the prepared foods. As she explains, stores must be proud of their product to put their name on it. She does admit with a laugh, that some find it highly amusing for her horse and buggy to be tied at the shopping cart collection area in the paved parking lot. "It is difficult to find covered "horse parking," she says quietly, "Not everyone is prepared for horse and buggy parking on their property." Miriam says with a sly smile that she buys frozen packaged foods "to sample them yet." "Just as I get home with the horse and buggy," Miriam says, "the treat is thawed and I put it in the oven to bake. We womenfolk eat it and talk about it, just like children, then we try to duplicate the taste." Miriam’s recipes can also easily be duplicated. With typical generosity, she allowed me to copy several recipes from her hand-written cookbook. She tells me that many of the entries were inherited from her mother, Rachael. I have no doubt that the following recipes were served more than one hundred years ago, around the same table that also was handed from generation to generation, just as the Mennonite way of life is today. Goot Smecking! Enjoy! Mix all vegetables together. Then bring to a boil ¾ cup white sugar, ¼ cup brown sugar, 1 cup white vinegar, 2/3 cup salad oil, 1 teaspoon PC prepared mustard, 2 teaspoons of salt, 1 teaspoon of celery seed and 1 teaspoon of mustard seed. Cool and pour over prepared salad greens. As most people do not have a spring house, cover and refrigerate for at least eight hours before using. Take what portions you need from the bowl, leaving the rest in the cool fridge to marinate until you wish to serve it again. This salad is considered a "sour" and will keep for several weeks. There is always one in the spring house, just in case friends drop in over a meal. You will need one unbaked 9" pie shell for this gooey, delicious dessert staple. Shoo Fly pies keep nicely in a pie cupboard. They also freeze well. Mix all ingredients thoroughly and reserve ¾ cup of crumbs for the pie’s top. Beat the egg lightly. Dissolve baking soda and cream of tartar in hot water. Then all ingredients should be mixed together. Let stand while making the crumb mixture. Mix the syrup mixture together with the crumb mixture and pour into a 9" unbaked pie shell. Distribute remaining crumbs on the top of the pie and bake at 350 degrees for 40 minutes. Note: This pie does not require a top crust. It makes its own. Mix the cornstarch with a little milk then mix all ingredients together. Put the mixture into a buttered casserole and bake at 325 degrees for approximately one hour. A brown skin should be baked on the top of the pudding. Stir this skin into the pudding and bake another one hour until another skin forms. Check carefully. Add a little milk if the pudding seems as though it is drying out. Test the rice as it bakes. You want it soft. Do not overbake this pudding. Serve with fresh thick cream and a sprinkling of cinnamon.